For the kale balls, place the chopped ciabatta in a food processor and blend until fine crumbs are formed. Set the ciabatta crumbs aside. Add the kale, onions and garlic to the food processor and blend until fine. Transfer the mixture to a large mixing bowl and stir in the ciabatta crumbs, egg, cheese, chickpeas, flour, salt and pepper. Using your hands, roll the mixture into 20 balls and refrigerate, 30 min. For the crumbing of the balls, whisk the eggs and water together in a mixing bowl. Place the flour in a second mixing bowl and the panko crumbs in a third mixing bowl. Dip each ball into the seasoned flour, shake off the excess and coat it in the egg mixture. Drop the ball into the panko crumbs and toss to coat it evenly. Fry the balls off in batches until golden and crisp, 2-3 mins each and drain on kitchen paper. Season it lightly as it comes out of the fryer. For the green tahini sauce, combine all of the ingredients in a food processor and blend until smooth. 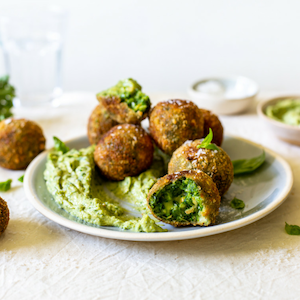 Serve the kale balls warm with the tahini sauce on the side for dipping. TIP: The balls can easily be made 1-2 days in advance. Roll the balls, cover and refrigerate until needed. Crumb the refrigerated balls right before frying to ensure a crisp coating.